The Denali Sound Bomb is eight times louder than a standard motorcycle horn! At 120 decibels, cagers of all shapes and sizes will jump out of your way! 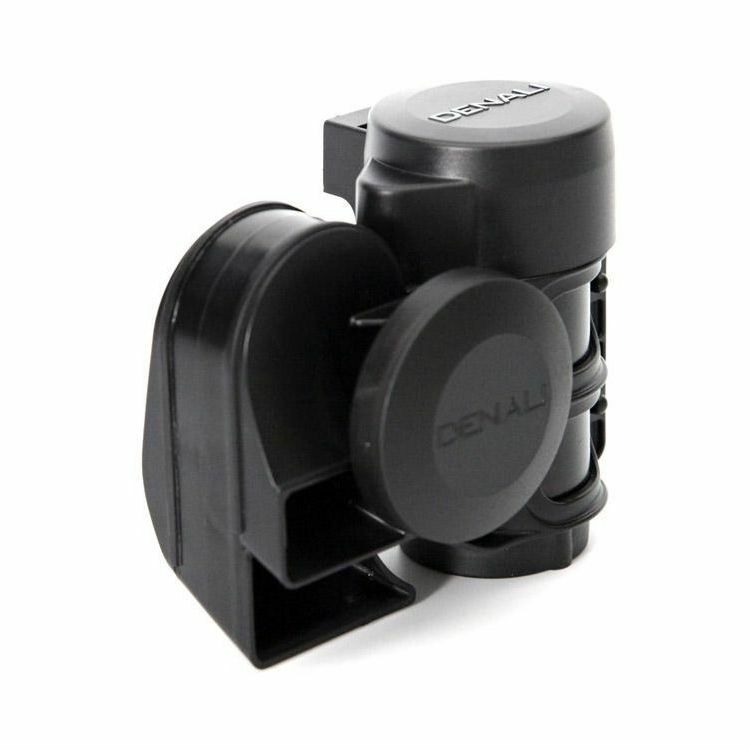 The unique design of the Denali compact horn features a rugged molded clamp that mechanically mates the compressor to the acoustic unit. This makes the SoundBomb virtually indestructible even in high vibration applications. Note: Mounting bracket sold separately. Plug-N-Play Wiring Harness For Dual-Tone Airhorns is sold separately. The Installation (pdf) calls for a 30 Amp fuse, however only a 20 Amp fuse is required. The horn looks good and seems to be made good. The reviews say its loud... we shall see. Also I like the fact its all black, so it matches my engine. To warn the cell phone coma induced cagers that my life matters. Reliability. This other 3 we purchased all work great. Safety feature to battle the Traffic Zombies. This particular Air horn has Great reviews. Because I wanted the loudest horn I could but on my bike. Advertised as a replacement for the Stebel Nautilus that ACTUALLY WORKS. I hope it delivers on the promise for almost twice the price. The first one burned out due to an improper installation. But they are loud when I need it. need loudest horn outside of train horns. This horn is crazy loud. It gets you noticed and is a great safety upgrade to any bike. I don't understand why small vehicles get small horns... Denali understands that and keeps the field even. Too many lazy drivers in Tallahassee. I live in Naples Italy!!! The horn on an FXR isn't loud at all, this horn is very loud. It is a great horn. Very loud for a bike horn. Recommend it. After watching a few videos about this, I just had to have it for my bike. Want to see if it will get peoples attention in my town. I was trying to fit it to my CBR600RR but I could not find a proper place to fit it. I wound up installing it in my Jeep Wrangler at least. Good for my Africa ride. Because no motorcyclist hath never said .... "my horn is too loud"
Positive reviews and the cost. After my nephew recommended it I did some research and liked the sound and reviews! Like to Sail... why not a boat horn?! Current custom Air Horn not loud enough. installed one of these horns on my other motorcycle, & Loved It ! Because every other horn is a joke in comparison. I love this thing so much that I am going to install one on my Jeep. Added safety to a friends bike, after he witness the effect form mine. It does a great job of getting people out of harms way. I have a 2014 Kawasaki Ninja 650. Has anyone had any issues connecting or mounting this horn to your bike? Any specifics? How did you mount it if so? BEST ANSWER: I would also be interested in any specific guidance for mounting the soundbomb to a Ninja 650. Red wire, black wire. Done. Hello, I want plug it into my F800GS 2014. But my BMW have CANBUS system. I want to buy wire for CANBUS. Where can I buy? BEST ANSWER: Best to use a electronic power distribution module to wire accessories to newer CANBUS systems. They won't interfere with the CANBUS operation, they allow several accessories to be used at the same time while providing protection and eliminate the need to use relays for high power switching. I read one of the reviews and was it correct that the unit can be disassembled to have the pump and horn seperate? If so how much tubing is between them? I'm thinking of this for my '07 Shadow Spirit 1100 and so it doesn't stick out like a wart on a witches nose I'm wondering if I could try to bury the compressor under my seat and the horn down under on the frame. BEST ANSWER: I installed it on my 2014 R1200GS and separated the horn and compressor with about 16" of tubing. It seems to work just fine. I don't think the length of the tube should matter that much (within reason) but I wonder if there would be a lag time between when you activate the horn switch and it actually goes off? Maybe you should test it with tubing before you install it to confirm and ensure you're happy with it. Dave D, did you get the "Horn Mount" from Denali in addition to the horn? I purchased the horn mount from Twisted Throttle. they have a selection for various bikes. I'm about as mechanically savvy as a blind man flying a spaceship. I do not know if you can take this unit apart. I will admit that mine sticks out a fair bit, so I see why you would want to take it apart if possible. I have seen a few brackets at lowes and Home Depot that could be used to mount it sideways and more flush. You honestly don't notice it after a while and the few times I've had to use it, I didn't care the location, it's louder than all get out and gets everyone's attention. it's a sealed unit, you cannot take it or dissemble the horn. It's a complete unit. Can this be rigged with an independent horn button? The horn button on my NC700X is not easy to access in an emergency. BEST ANSWER: Yes, you can do this. You will need the (optional) "Plug-N-Play Wiring Harness" which has the needed fuse and relay needed to safely run this horns high current draw -- Do NOT upgrade the wimpy OEM horns without using a relay! Aftermarket momentary-contact switches are available which you can locate where you want on the bike: search a good parts site for a "mini-push-button-switch" for one possible example. Depending on your skills and obsession with clean installations, this is a 2- or 3-beer project. Of course, the only limiting factor is your wiring ability. This horn likely draws quite a bit more power than most factory original horns so full wiring is the safe route. You need fused power to a relay, then to the horn. Run the negative from the horn to ground. Then run signal wires from the relay up to your preferred switch. Will this fit on my 2013 Honda CBR500R? If so, where would be the best option? I have a 2012 BMW F650gs bike with the Denali Soundbomb Compact Air Horn work with this? Do I need the wiring harness too? BEST ANSWER: I am not familiar with that exact bike but in most cases you just have to find a spot to mount it. It can be behind the fairings or underneath the forks, wherever, believe me, it is going to be heard. Regarding the wire harness, unless you know how to build a harness of your own and wire the relay that comes with it, buy the kit. Marcia: Unfortunately, this is not a plug and play horn - meaning you cannot simply connect the two wires from the stock horn and connect them to the Denali. It requires significantly more power than the stock horn, which necessitates the use of a relay that Denali does include with your purchase. However, it does not come with a wiring harness, which needs to be purchased separately or made by you. I made my own wiring custom to the bike and installed the Denali Powerhub2 as well. This is an awesome horn and really gets the attention of those around you. I plan on installing the Soundbomb my other bike and cannot recommend it enough. Do not let the need for a wiring harness detract from buying and installing it. I don't know of a reason why it wouldn't work. Placement may be difficult as you'll have to find somewhere to mount it. I ordered mine with the wiring harness. This horn requires a lot more power than the stock one to operate and the wiring harness comes with that power lead. Install was easy. I bought the wiring harness because I wanted a simple installation. It came with everything I needed. Btw, I love the Denali. I am wanting to fit this on my 2013 FLSTF (Harley Fatboy) - any additional mounting hardware or relays are required? BEST ANSWER: I have no Harley mounting advice. You will need to buy the wiring harness that is a second purchase item. This harness includes a relay. Impressive horn. Will make your Harley even louder. Yes, unfortunately you'll have to purchase the relay. I would recommend the mount as well. It's possible to mount it without with maybe a zip-tie or hose clamp, but the mount makes it cleaner looking. Bryan - Could you recommend me the right mounting from Revzilla - thanks! Would it fit 2012 Harley Davidson Roadking?, I kow it's universal, but I really don't want to have hard time. BEST ANSWER: Yes, I would "think" it should fit. I mounted mine on a 2014 BMW K1300S which has fairings and relatively little space but was able to find a mount. Also I found running the ground wire "directly" to the battery ground facilitated a successful install. And for the record, this thing is loud and does a great job letting others know you are there. Install/Directions were easy to follow; look on soundbomb device next to connectors and there is a "+" / "-" for the connections. Thanks Kirt, this is very helpful my friend, I appreciate your input. I install the horn on a suzuki bandit. It was easy for me to install the horn. I bought 2 more for my friend after he heard the horn, He install his on a kawasaki concour 1400 and his truck. On a harley, you must have more then enough room to fit the horn. You might have to fabricate a bracket to install the horn. D'ont forget to install a relay with a 25 amp fuse. it draws a lot of juice. Thanks a lot my friend, very helpful indeed. Have you checked to see if they (Denali) have a bracket to fit your bike? If so, just bolt it on. If not, I recommend building a small box using the dimensions so you have a physical size to check for a fit. When it's in your hand it's bigger than you might think, however it's not super heavy so (If you build one) it doesn't need a monster sized bracket. Thanks Jeff, will try that too. hi, will this fit on a CBR 300 '15 ? BEST ANSWER: Yep. But find a place to mount it. It's loud but hard to hide on a full fairing bike. I want to mount this on my Yamaha FZ 07 what will I need, this harness and bracket, what braket and so on? BEST ANSWER: the wiring takes a little work. you need a dedicated circuit from the included relay. It's about as easy as custom wiring gets. I'm sure you can find a nice place to mount it.